So I think almost everyone loves the look of live plants in their home, but not everyone can keep plants alive inside their home. So here’s four ways to add the look of greenery to your home. You can listen to the podcast on greenery HERE. Yvonne does the same thing. 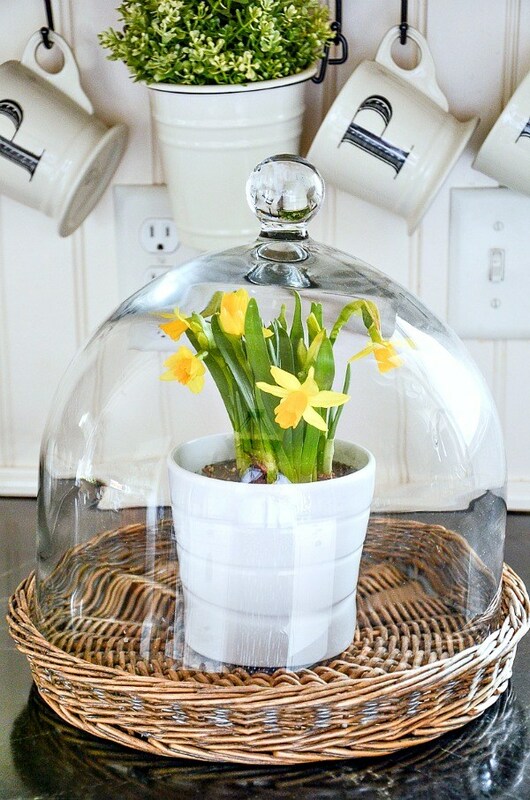 See the sweet daffodils in Yvonne’s cloche? Her post is HERE. Of course another option is to use real plants without a cloche. 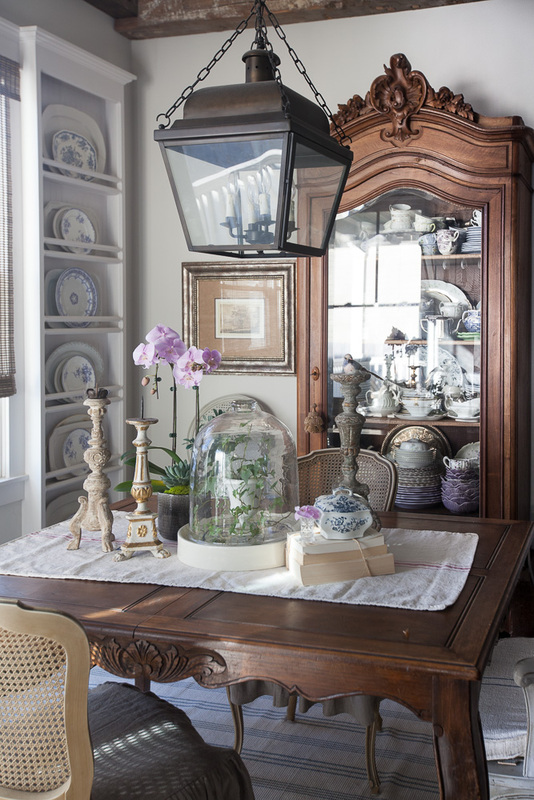 They add a tremendous amount of personality to a room, but they do need care to keep them alive. Yes this option is not for everyone. This is Kelly’s cyclamen. 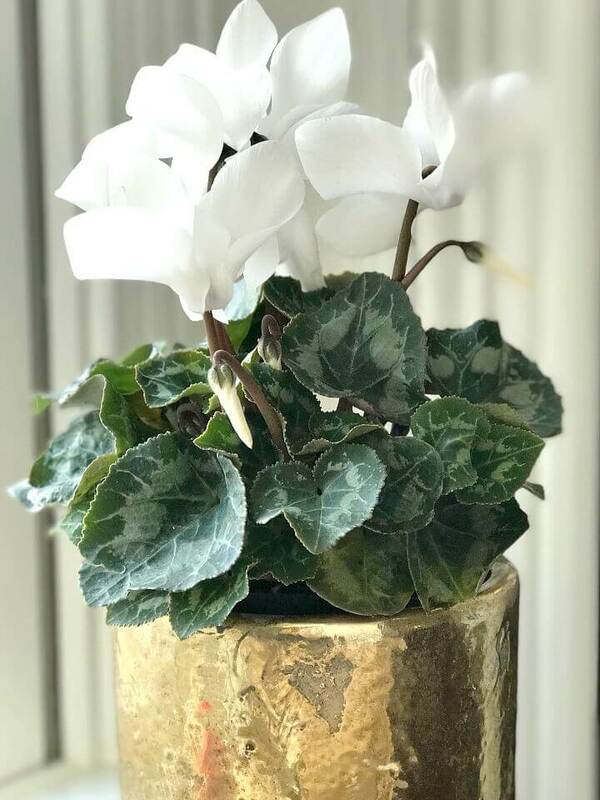 You can read her post on caring for a cyclamen and keeping it alive. 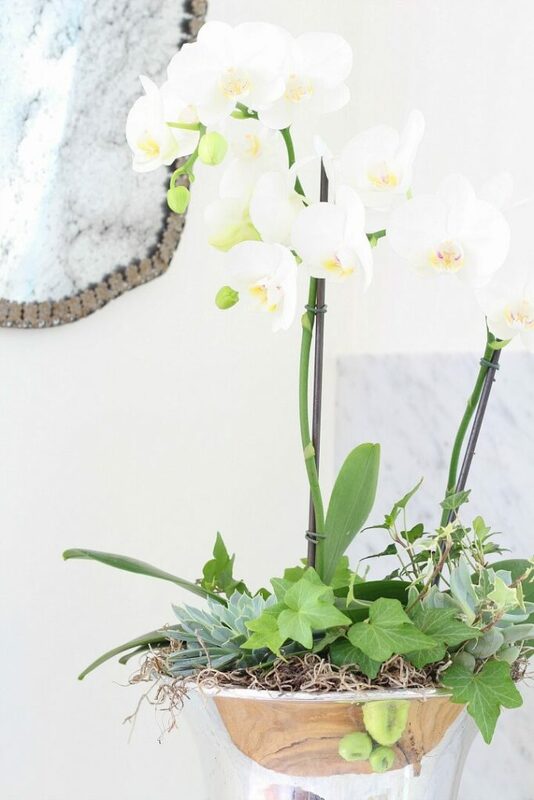 You can also combine several plants in one planter like Kelly did below. You can find her post on the arrangement HERE. I do love grabbing some flowers form the grocery store when I can. The photo below is from Stone Gable. These are easy to make and are real moss, but don’t require any maintenance. CLICK HERE for instructions. The roses shown are preserved real roses. They were very expensive though. I am not sure how they preserve them, but they are not dried. The way they preserve them maintains the color, while drying does not. I don’t normally go for faux, but these look great in person. I do have an olive tree, but when I cut branches, they don’t last that long before they turn brown. You can purchase a set of these (affiliate link) HERE. 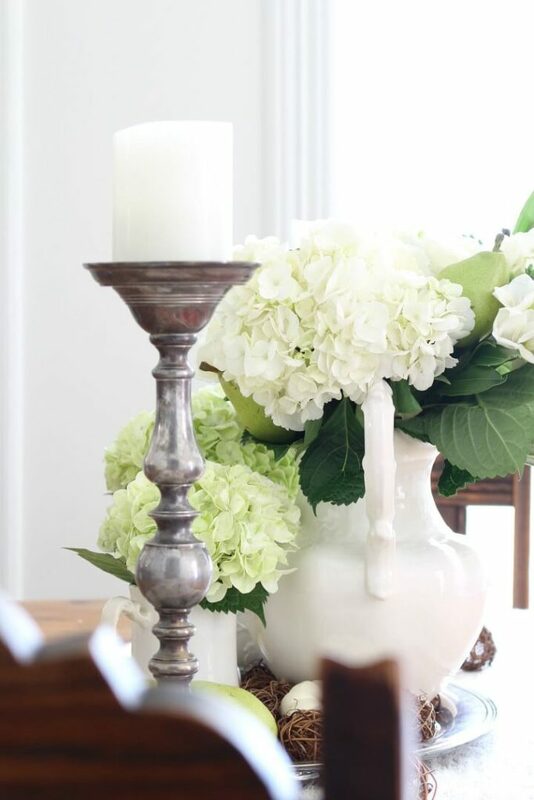 Boxwoods are great to use because they are preserved. They are real, but require no care. They can be expensive, but I have had some of mine for several years. They do last a long time. I have roses like you showed. I worked at a shop that did that type of preservation. It’s call freeze dried. We did every type of flowers from prom and bridal bouquets. To funeral flowers. We also did bulk amounts of flowers and sold them. My favorite was sun flowers and pink roses. I’m sure you have answered this question before, and I have looked through your site to try to find it. But alas, I didn’t. 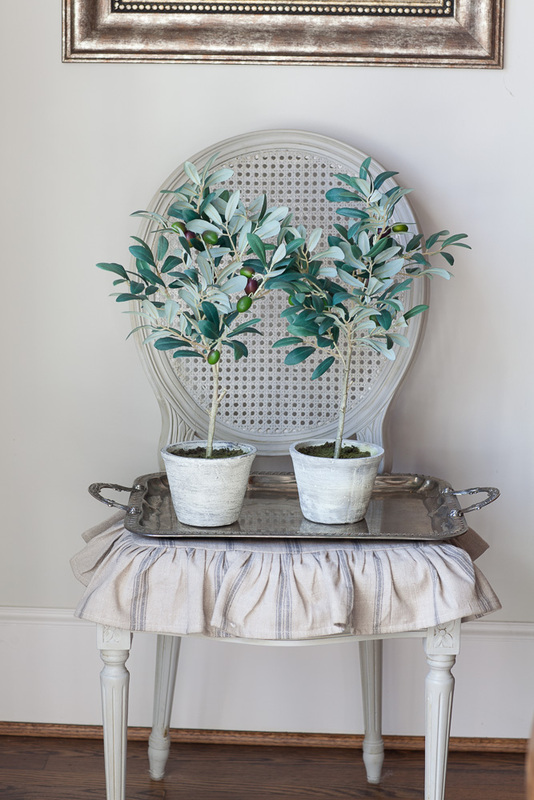 Would you mind sharing your paint colors on the wall and trim of the photo showing the 2 olive trees sitting on the silver tray, on the white chair (from the article about adding greenery to your home)? 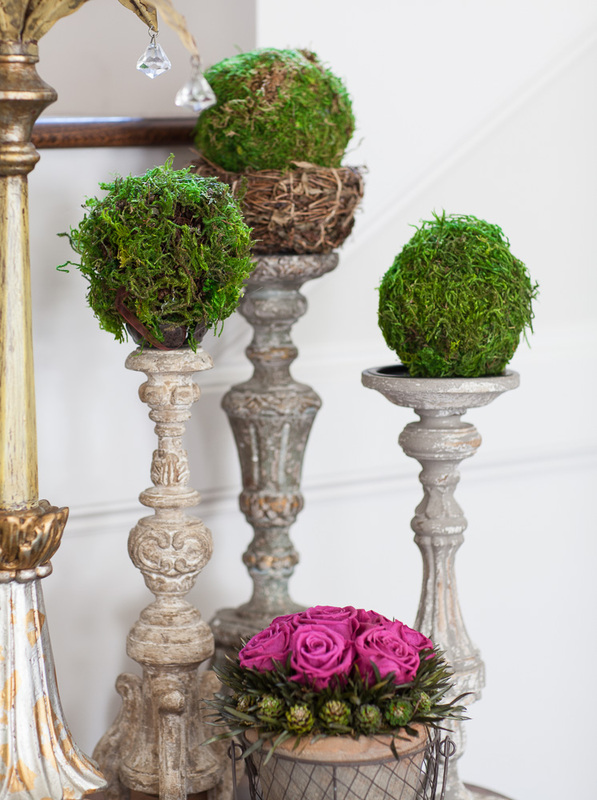 Loved the diy on the moss balls. Thx for sharing…and for all of your inspiration! I just love the pops of greenery around the house, glad it’s the pantone of the year! I also absolutely love the lantern chandelier, I’m sure you had it for a while, if still available, where?. Sure wish I could find one like that, very classic and classy!! Love the preserved boxwood. They are always so expensive. Is there a method to craft them ourselves? Love this post Anita! 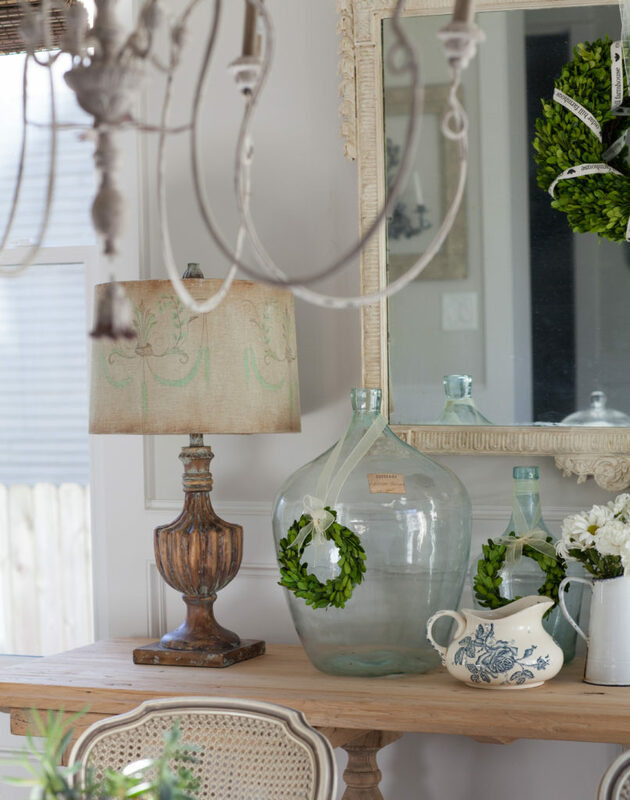 A touch of greenery does SO much for a room! Yes the real preserved boxwoods are expensive. They are expensive even when you buy them wholesale. You can buy the artificial ones, but I don’t think they look the same. I don’t know how they preserve the boxwoods, so I don’t know how hard it would be do to that yourself. Good question! Thank you for providing all the pictures of the pretty boxwoods.